Since today is National Coffee Day, we’re resharing our recent profile of Burlap and Bean. If you’re celebrating the day today, please try to make at least one of those cups Fair Trade! 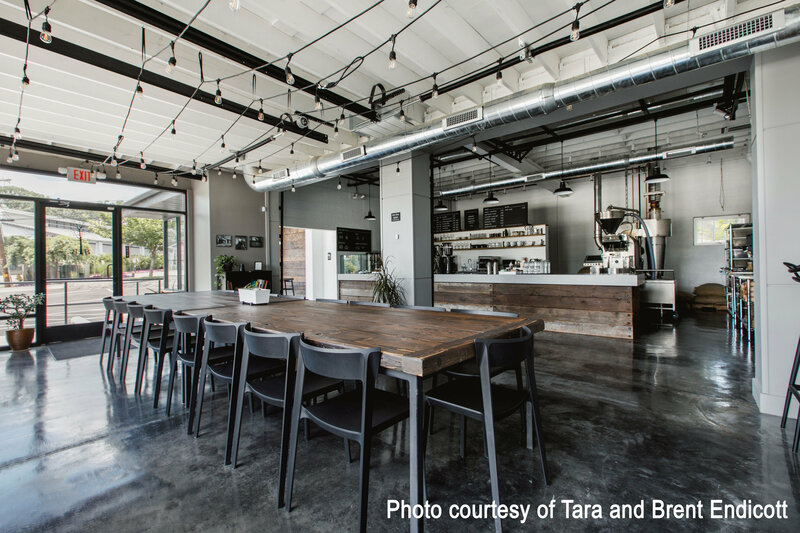 You do not have to sit down and talk with Tara and Brent Endicott, owners of Burlap and Bean, to know that they love the Media Community and are proud to be the first Fair Trade Coffee roasters located in Media, the First Fair Trade Town in the United States. When they renovated Marty’s Auto Mechanic Shop into Burlap and Bean, they kept the windows and maintained the facade of the auto mechanic shop. People sitting at the community farm table can keep an eye on the construction going on across the street, and later on the coming and goings of Media’s West End. On one wall of the coffeehouse is a picture of Marty to commemorate the original owner of the location. While on the wall opposite the counter is a map of the world with dots indicating where Fair Trade Certified coffee is grown. This decor sums up the Endicotts perfectly: they honor a small business owner who helped build Media’s economy while signifying that their business is firmly Fair Trade. It came as no surprise to me when the Endicotts told me that Burlap and Bean purchased their space in the West End of Media before it began it’s current real estate boom. Tara is a lifelong resident of Delaware County and opening a coffee house has been a dream since high school. However, Burlap and Bean in Newtown Square did not open it’s doors until November 2006. Tara and Brent, along with Brent’s brother and wife, first researched the industry and it’s effect on the environment and workers. When it opened, Burlap and Bean chose to sell Fair Trade Certified and Organic coffee and tea because it has a positive long term effect on the coffee growing communities it impacts and it does not hurt the environment. Fair Trade, Tara believes, also attracts customers who share similar values to their family. Visit Burlap and Bean Roasthouse at 455 West Baltimore Avenue, or virtually at their Facebook page, Instagram, or website. Media TimeBank Generously hosted by Market Acumen, Inc.